Winter Season – Summer Season – Indian Climate: Pressure, Winds, Rainfall, Temperature, Cyclones, Western Disturbances. Loo, Andhis, Norwesters. The season of the retreating monsoon or cool season. November – March. January is the coldest month. Sun’s apparent path is to the south of equator. Clear sky, pleasant weather, low temperature, low humidity, high range of temperature, cool and slow north-east trade winds. The diurnal range of temperature, especially in interior parts of the country, is very high. The isotherm of 20°C runs roughly parallel to the Tropic of Cancer. To the south of this isotherm the temperatures are above 20°C. Here there is no distinctly defined winter weather. Some parts of Kerala and Tamil Nadu typically experiences temperatures near 30°C. To the north mean temperatures are below 21°C and the winter weather is distinct. The mean minimum temperature is about 5°C over north-west India and 10°C over the Gangetic plains. Dras Valley in Kashmir is the coldest place in India. The minimum temperature recorded at Dras was – 45°C in 1908. High air pressure prevails over large parts of north-west India due to low temperatures coupled with divergence induced by the ridge of the STJ. Pressure is comparatively lower in south India. The winds start blowing from high pressure area of north-west to low pressure area of south-east. The wind velocity is low due to low pressure gradient. The path of the winds depend on pressure gradient and physiography. The spell of fine weather over north-western and northern India is often broken due to inflow of western disturbances. They intensify over Rajasthan, Punjab, and Haryana. They move eastwards across the sub-Himalayan belt up to Arunachal Pradesh. They cause light rain in the Indus-Ganga plains and snowfall in the Himalayan belt. After the passage of the disturbance, widespread fog and cold waves lowering the minimum temperature by 5° to 10°C below normal are experienced. Fog lowers visibility and causes great inconvenience for transportation. This is the season of least tropical cyclone activity. The frequency of tropical cyclones decreases with the advancement of the season. This is due to low sea surface temperature and exit of ITCZ farthest south. The storms which are born in the Bay of Bengal strike Tamil Nadu and bring heavy rainfall. Some of them cross the southern peninsula over to the Arabian Sea. Some storms originate in the Arabian Sea and move towards either north or west. The retreating winter monsoons pick up some moisture while crossing the Bay of Bengal and cause winter rainfall in Tamil Nadu, south Andhra Pradesh, south-east Karnataka and south-east Kerala (Usually in the first weeks of November). The highest seasonal rainfall of about 75 cm between October and December. Most of it occurs along the south-eastern coast of Tamil Nadu and adjoining parts of Andhra Pradesh. Thereafter, it gradually decreases. The western disturbances also cause a little rainfall in north-west India. The amount of rainfall gradually decreases from the north and north-west to east (it is opposite in rainy season). 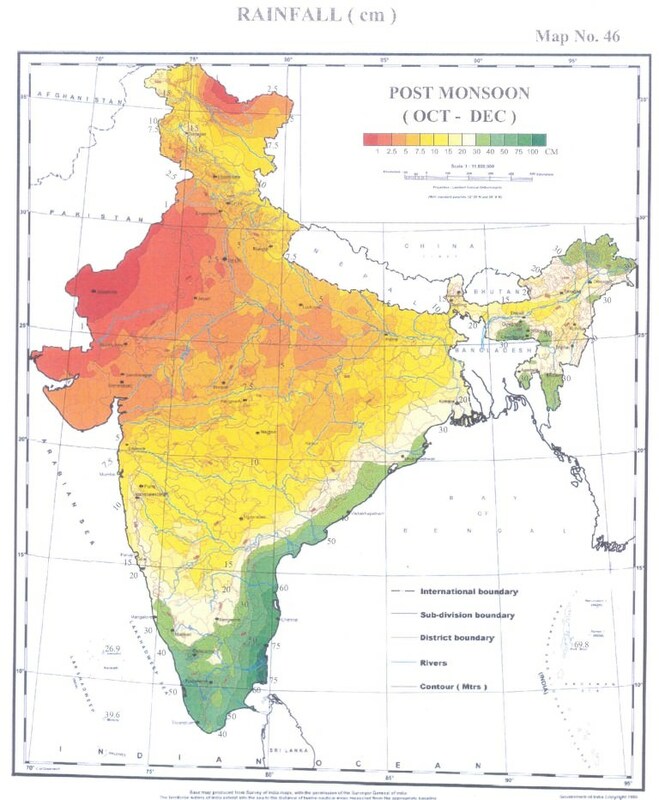 The northeastern part of India also gets rainfall during the winter months. High temperature and low humidity are the chief characteristics. Sometimes referred to as pre-monsoon period. High sun’s insolation due to apparent movement of sun between the equator and the Tropic of Cancer. 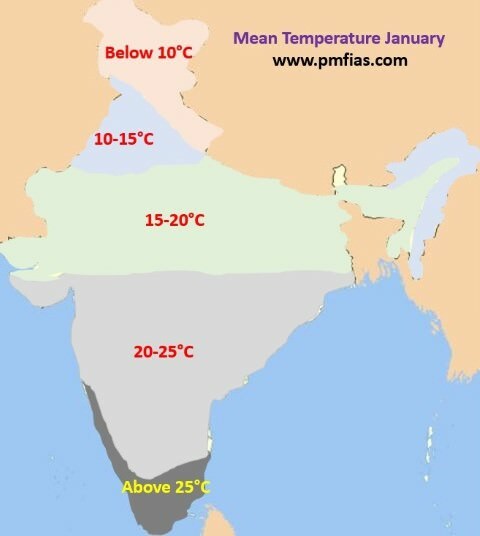 The southern parts of the country are distinctly warmer in March and April whereas in June, north India has higher temperatures. In March, the highest temperatures occur in the southern parts (40-45°C). 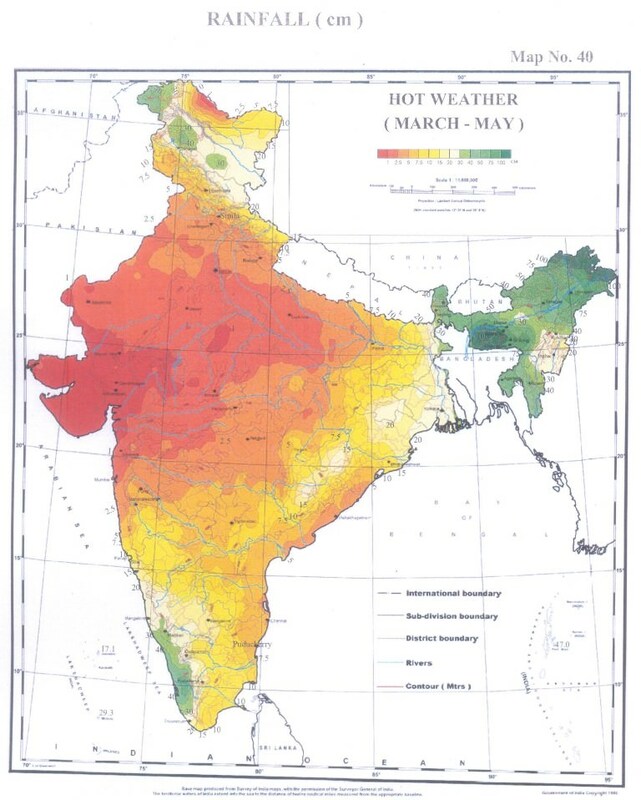 In April the highest temperature of about 45°C is recorded in the northern parts of Madhya Pradesh. In May the highest temperature shifts to Rajasthan where temperatures as high as 48°C may be recorded. In June the maximum temperature is in Punjab and Haryana. The highest temperatures recorded are 50.5°C at Alwar on 10th May, 1956 and 50.6°C at Ganganagar on 14th June, 1935. The highest temperatures are recorded just before the onset of the southwest monsoons (late May). The diurnal range of temperature is also very high. It may be as high as 18°C in some parts. The maximum summer temperatures are comparatively lower in the costal and southern peninsular regions due to moderating effect of the sea. The temperatures along the west coast are comparatively lower than those prevailing on the east coast due to the prevailing westerly winds. There is large contrast between land and sea temperatures. 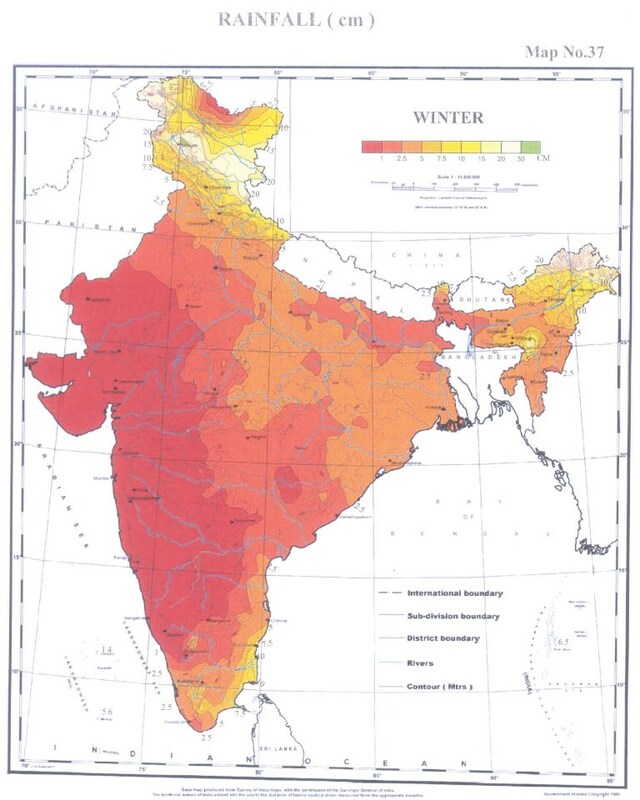 Northern and central parts of India experience heat waves in this season. Most of the heat waves develop over Rajasthan, Punjab and Haryana (location far away from the sea). From here they spread over Uttar Pradesh and Bihar. 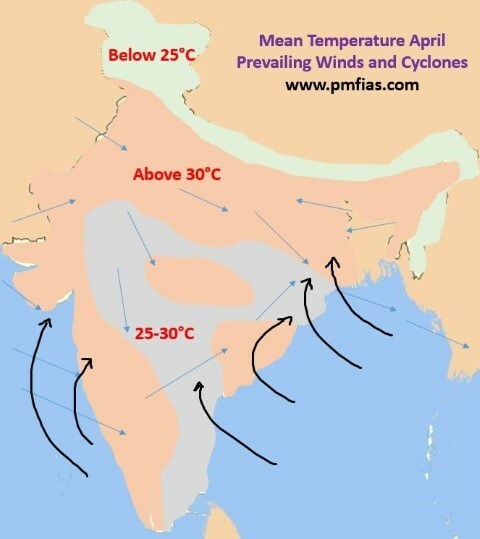 The strong north westerly winds (caused due to strong divergence in north-west India) with a long land journey over hot regions check the onward march of the sea breeze over eastern coastal belt and create heat wave conditions over Odisha and Andhra Pradesh. The heat waves strike by the end of April and their maximum occurrence is in May. They last till the onset of southwest monsoon. The normal duration of heat waves is 4 to 5 days. However, heat waves are rare over the peninsula south of 13°N latitude due to maritime conditions prevailing there. The atmospheric pressure is low all over the country due to high temperature. But strong dynamically induced divergence over north-west India prevents the onset of south-west monsoons. There is a marked change in the direction and speed of the winds from winter. The winds are by and large light and variable. Loo winds originate over Iranian, Baloch and Thar deserts. In May and June, high temperature in northwest India builds steep pressure gradient. Hot, dust laden and strong wind known as loo blows. Loo normally starts blowing by 9.00 A.M., increases gradually and reaches maximum intensity in the afternoon. It blows with an average speed of 30-40 km per hour and persists for days. The strong dust storms resulting from the convective phenomena are locally known as andhis (blinding storms). They move like a solid wall of dust and sand. The wind velocity often reaches 50-60 kmph and the visibility is reduced to a few metres. Such dust storms are common in Rajasthan, Haryana, Punjab, Jammu region, Delhi, Uttar Pradesh, Bihar and Madhya Pradesh. They are short lived. The squall and showers which follow these storms bring down the temperature sharply temporarily. The strong convectional movements related to the westerly jet stream lead to thunderstorms in eastern and north-eastern part of the country. They normally originate over Chota Nagpur plateau and are carried eastwards by westerly winds. The areas with highest incidence of thunderstorms are Assam, Arunachal Pradesh, Nagaland, Mizoram, Manipur, Tripura, Meghalaya, West Bengal and the adjoining areas of Odisha and Jharkhand. In West Bengal and the adjoining areas of Jharkhand, Odisha and Assam, the direction of squalls is mainly from the northwest, and they are called norwesters. They are often very violent with squall speeds of 60 to 80 km per hour. Hailstones sometimes accompany showers and occasionally attain the size of a golf ball. They cause heavy damage to standing crops, trees, buildings, livestock and even lead to loss of human lives. However, they are, sometimes, useful for tea, jute and rice cultivation. In Assam, these storms are known as ‘Barodoli Chheerha’. The period of maximum occurrence of these storms is the month of Vaisakh (mid-March to mid-April) and hence, they are locally known as Kalabaisakhis, the black storms or a mass of dark clouds of Vaiasakha. In the south the thunderstorms occur in Kerala (Mango Showers) and adjoining parts of Karnataka (Blossom Showers) and Tamil Nadu, particularly during evenings and nights. Their frequency and intensity gradually decrease with advancement of summer. Approximately 4, 3 and 2 western disturbances visit north-west India in March, April and May respectively. They cause snowfall in higher reaches of the Himalayas. 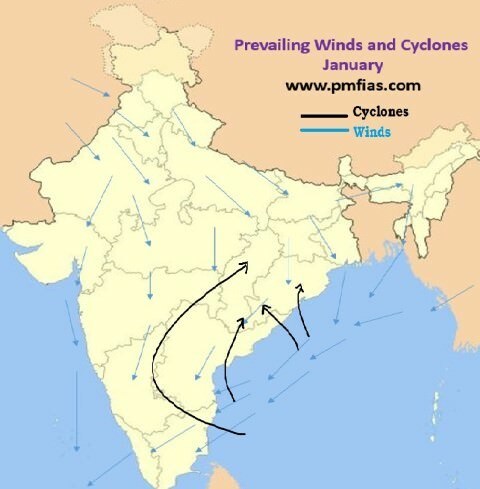 Tropical cyclones originate in the Bay of Bengal and Arabian Sea. A few cyclones are formed in the Bay of Bengal in the month of March but they do not affect the mainland of India. Their frequency rises steeply in April and the number of cyclones originating in May is more than double than those originating in April. About three-fourths of the tropical cyclones are born in the Bay of Bengal and the rest originate in the Arabian Sea. Most of the depressions in April originate to the south of 10°N while those originating in May are born to the north of this latitude. Most of the storms of this season initially move west or north-west but later they recurve northeast and strike Bangladesh and the Arakan Coast of Myanmar. Very few hit Indian coast while some dissipate over the sea itself. The whole of the east coast of India, the coastal areas of Bangladesh and Arakan Coast of Myanmar are liable to be hit by tropical storms in May. Many of them are quite severe and cause heavy damage to life and property. In the Arabian Sea, major storms are formed in May between 7° and 12° N latitudes. Most of them move away from the Indian coast in a north-westerly direction and dissipate in the sea. Few originate close to the Indian coast. They move towards the north-east and hit somewhere along the west coast of India. This season is not totally rainless (only one per cent of the annual rainfall). In the northeastern parts of the country, dust storms bring little rainfall. The precipitation in Kashmir is mainly in the form of snow caused by western disturbances. The norwesters bring some rainfall in Assam, West Bengal and Odisha. The intensity of rainfall is high. The rainfall brought by the norwesters is known as the spring storm showers. This small amount of rainfall is very useful for the cultivation of tea, jute and rice and is known as tea showers in Assam. Coastal areas of Kerala and Karnataka receive rainfall from thunderstorms. Such showers are called mango showers in Tamil Nadu and Andhra Pradesh because they are very beneficial to mango crop. In Karnataka they are called cherry blossoms due to their effect on the coffee plantations.